Traser Glow Rings, Power Rings or Glowrings are fantastic glowing keyrings that utilise new technology enabling it glow in the dark for over 10 YEARS without batteries or recharging!! GlowRings are filled with a special gas (tritium) housed in a high density borosillicate glass shell that measures approximately 5cm. 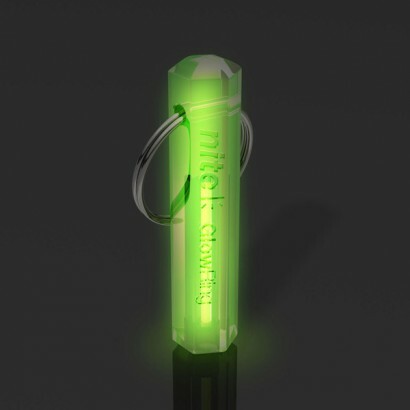 Attach Glow Rings or the new Power Ring to anything and let it GLOW and be seen in the dark. A very handy and practical glow in the dark keyring useful for a wide range of applications: camping, fishing, walking, scouts etc etc. The GlowRing Safety Marker is made from unbreakable, clear but vibrantly tinted polycarbonate casing. The permanent light is provided by state of the art technology called GTLS (Gasseous Tritium Light Source) which is self powered and does not require batteries or charging by sunlight. GlowRings can be attached to anything via the keyring and can be easily located from as far away as 30ft in complete darkness and will glow continuously for 10 years and beyond. Glows for 10 years ! Dimensions 4.5 cm x 1 cm approx. 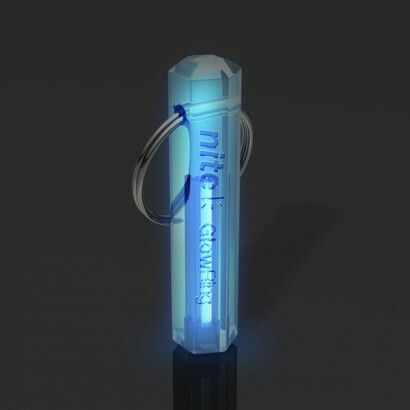 The ultimate glow in the dark keyring!